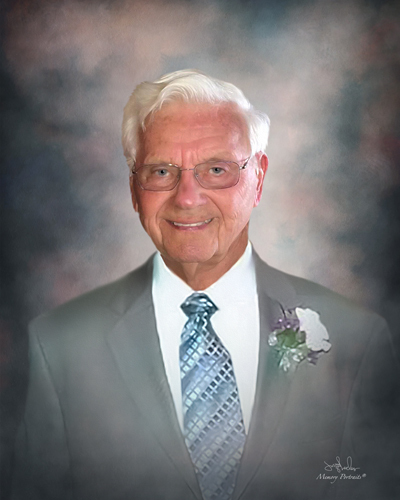 Frank M. Schwitz, age 91, of Evansville, IN, passed away Thursday, January 24, 2019, at The Hearth at Juday Creek in Granger, IN. Frank was born September 8, 1927, in Evansville, IN, to Otto and Zilpah (Moody) Schwitz. He graduated from Central High School in 1946 and went on to earn his Bachelor’s Degree in Teaching from the University of Evansville and his Master’s Degree in Education from Indiana University. Frank taught and coached in the EVSC for 42 years. He was a physical education teacher and driver’s education teacher at Howard Roosa Elementary School, North High School, and Harrison High School. Frank began teaching at Harrison High School in 1962, the year it opened, and he later retired from there in 1992. Frank was a man of God and always kept God first. He went to church his entire life. When Frank was a member of St. James United Methodist Church, he taught a Sunday School Class for many years. Most recently, he attended Central United Methodist Church for the past few years. Frank loved his wife, Dora, very much. His son, 3 grandsons, and 4 great grandsons meant the world to him. All 8 boys have played or currently play baseball, continuing the Schwitz legacy. Frank loved visiting with his family in Granger, IN, watching ballgames, and vacationing with family. They had many vacations to various locations, but Panama City Beach in Florida was the family’s favorite spot. Coach was a great athlete in high school. He was a 3-year starter, team captain, Kiwansis Award Winner in basketball at Central, and led the Bears to the 1946 Indiana State Finals at Hinkle Fieldhouse in Indianapolis. Frank was also a star pitcher in high school where he threw multiple no-hitters. He was drafted by the Evansville Braves minor league team after graduating from high school. Frank’s passion in life was teaching and coaching. He was Harrison’s first varsity basketball coach and first varsity baseball coach. Frank coached basketball for 10 years and baseball for 29 years. During his summers, Coach ran an Evansville Civic League baseball program for hundreds of kids. It began at East Side Park and moved to Wesselman’s Park, years later. Frank and Dora moved up to South Bend, IN, October of 2017 to be closer to family. It was a great year for all of us to be together again. We’ll always cherish the times that we had together. Pa, as his family called him, was a great man, teacher, and coach. He touched so many lives, including our own. Pa was humble, kind, and a true gentleman. He had integrity, character, and was a mentor and treasure to many – a role model who was honest in everything he did. Pa taught life lessons that impacted students and players for years to come. His influence can be seen in the numerous successful men and women he taught and coached in his lifetime. He was also very proud of helping many of his high school athletes to go on to earn a college degree and experience the joy of playing college athletics. Frank was a faithful husband, the best Dad, Pa, and Great Grandpa ever! We were so blessed to have had him in our lives. Pa, you will be loved, remembered and missed forever. You gave everything you had to help other people – a local legend who was our “hero.” We have big shoes to fill and our family will never be the same. Pa, we know you are in Heaven, and we will see you again – WELL DONE, FAITHFUL SERVANT! He is survived by his son, Mark Schwitz; grandchildren, Ryan Schwitz, Michael Schwitz, and Matthew Schwitz; great grandchildren, Brayden Schwitz, Colten Schwitz, Masen Schwitz, and Carmen Schwitz. He is preceded in death parents and beloved wife, Dora L. (Parker) Schwitz, who passed away October 24, 2018, after 64 years of marriage. Funeral Services will be held at 10:00 a.m., Friday, February 1, 2019 at Boone Funeral Home East Chapel – A Family Tradition Funeral Home, 5330 Washington Avenue with Reverend Dewey Miller and Nancy Reid officiating. Burial will be Private at Sunset Memorial Park. Friends may visit from 3:00 p.m. until 7:00 p.m., Thursday, January 31, 2018 at BOONE FUNERAL HOME EAST CHAPEL. Memorial Contributions may be made to: Central United Methodist Church at 300 Mary Street, Evansville, IN 47710.